I’m in the final stages of completing Connective Tissue. 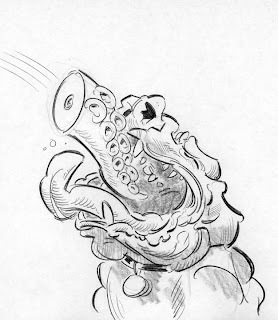 I don’t want to ruin any of the story, so I won’t explain what the dog is eating here, but I wanted this cartoon pooch to be grotesque and somewhat monstrous (yet still somewhat “cute”). 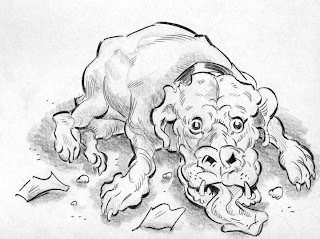 I started off drawing a more realistic dog to work out the anatomy, and then moved on to deforming him. 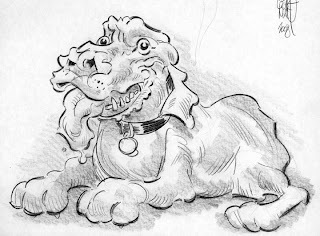 Monster pooch (version in book). 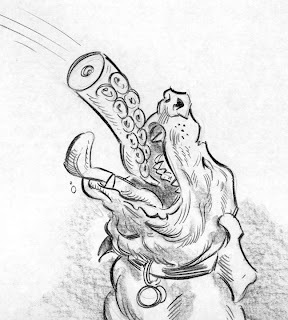 Rejected version. I like the face, but the body is bad, especially the forepaws. It looks like Clifford the Big Red Dog after huffing a snootful of speed. Spot illo for Connective Tissue. What can I say? I like tush. Nuff said.